Neuronal migration defects are rare causes of seizure disorder and developmental problems. Schizencephaly the most severe form is an extremely rare entity. Here a rare case of bilateral schizencephaly (open and closed type in the same patient) is reported. Neuronal migration defects are rare causes of seizure disorder and developmental problems. The spectrum of these disorders ranges from gyral abnormalities, i.e. disturbances in the formation of cortical surface to complete focal agenesis of an entire region of the cerebral cortex as in schizencephaly  (most severe form). A 10-year-old male child presented to our pediatric outpatient department, with complaints of inability to speak since birth and seizures since 5 years of age (generalized tonic and clonic type). He was born at term, by vaginal delivery, to a nonconsanguineous couple. Antenatal, natal, and postnatal periods were uneventful. There was delay of language milestones since birth. Other fields of development were normal. No other abnormality was present on examination. Hearing was normal. We investigated the child for the cause of seizures and speech delay. Routine blood investigations, electrolytes, and liver function tests were normal. Electroencephalography showed isolated bursts of sharp waves occurring independently on either side. Magnetic resonant imaging (MRI) of brain done in our hospital on Philips Achieva (1.5 T, Philips, Holland) showed grey matter lined cerebrospinal fluid (CSF) filled clefts, in bilateral frontal regions, extending from the pial surface of brain through the white matter to ependymal surface of bodies of lateral ventricles. On the left side, the cleft was communicating with the ventricle [Figure 1]a, b. On the basis of MRI findings, diagnosis of bilateral schizencephaly was made. For seizures, he was taking oral phenytoin but seizures were poorly controlled. The patient was started on tab sodium valproate (@10 mg/kg/day dose) and was discharged on the same dose. The patient is regularly being followed up, and there has been no episode of seizure till 6 months of treatment of our follow-up. The patient has made very small progress regarding speech, despite speech therapy. The presence of schizencephalic clefts lined by grey matter suggests that these defects occur early in the second to fifth month gestation, prior to the end of neuronal migration. Etiologies include in utero infections, cytomegalovirus and herpes virus, maternal trauma of several types, teratogens, alcohol and drug abuse, warfarin, and monozygotic twin interactions. Role of gene EMX-2 mutations is controversial. In our case, there were no stigmata of congenital infections. The antenatal profile was normal. The spine and cranium were normal. Parents of the child were also phenotypically normal. MRI examination is definitive and is the imaging modality of choice. MRI identifies the anomalous grey matter along the cleft as well as the associated abnormalities such as heterotopias. Pediatric cases reported in India had severe complex associated brain abnormalities. ,, Except hypoplastic cavum septum pellucidum, there were no other abnormal findings in our case on MRI. Our case highlights the possibility of a very rare entity associated with seizures and speech delay. MRI, being a modality able to pick these abnormalities, is thus advisable in all cases of childhood seizures and developmental delays. There is very scant literature on schizencephaly in Indian pediatric population. Carefully maintained patient records can help us build the database in Indian pediatric population. 1. Camfield C, Camfield P. Preventable and unpreventable causes of childhood-onset epilepsy plus mental retardation. Pediatrics 2007;120:e52-5. 2. Back AS. Congenital malformations of the central nervous system. In: Taeusch HW, Ballard RA, Gleason CA, editors. Avery's diseases of the newborn. 8 th ed. Philadelphia: Saunders Elsevier; 2005. p. 938-63. 3. Curry CJ, Lammer EJ, Nelson V, Shaw GM. Schizencephaly: Heterogeneous etiologies in a population of 4 million California births. Am J Med Genet A 2005;137:187-9. 4. Prasad M, Iype M, Nair PM. Callosal agenesis and open lip schizencephaly. Indian J Pediatr 2006;73:838-9. 5. Choh NA, Choh SA. 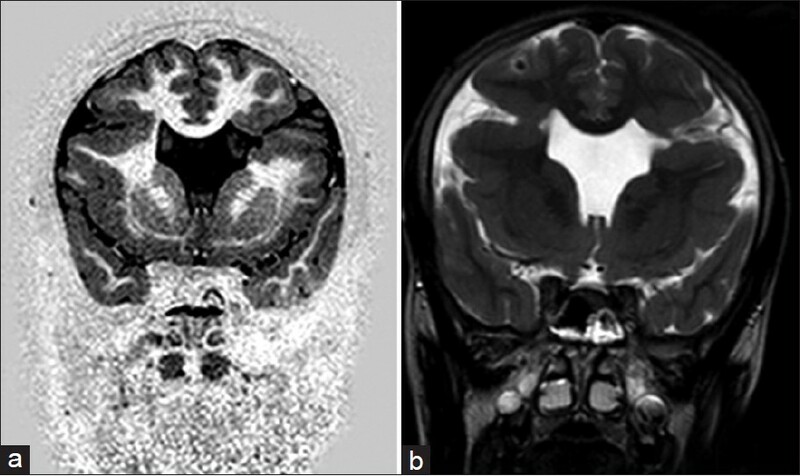 MRI demonstration of subtotal agenesis of the cerebellum with closed-lip schiencephaly. Ann Saudi Med 2011;31:207-8. 6. Dubey AK, Gupta RK, Sharma P, Sharma RK. Schizencephaly type I. Indian Pediatr 2001;38:949-51. 7. Yakovlev PI, Wadsworth RC. Schizencephalies: A study of the congenital clefts in the cerebral mantle; clefts with fused lips. J Neuropathol Exp Neurol 1946;5:116-30. 8. Bapuraj JR, Katariya S, Khandelwal NK. Congenital brain anomalies. In: Berry M, Mukhopadhyay S, Chowdhury V, Puri S, Gupta AK, editors. Diagnostic radiology paediatric imaging. 2 nd ed. New Delhi: Jaypee Brothers; 2004. p. 313-29. 9. Jones BV. Schizencephaly. In: Barkovich AJ, Moore KR, Grant PE, Jones BV, Vezina G, Koch B, et al. editors. Diagnostic imaging pediatric neuroradiology. 1 st ed. Utah: Amirsys; 2007. p. I-36-39. 10. Eyre J. Neurodevelopmental disorders. In: Donaghy M, editor. Brain's diseases of nervous System. 12 th ed. New York: Oxford University Press; 2011. p. 207-36. 11. Tietjen I, Bodell A, Apse K, Mendonza AM, Chang BS, Shaw GM, et al. Comprehensive EMX2 genotyping of a large schizencephaly case series. Am J Med Genet A 2007;143A:1313-6. 12. Gusnard DA, Zimmerman RA. Craniocerebral anomalies. In: Lee SH, Rao K, Zimmerman RA, editors. Cranial MRI and CT. 4 th ed. USA: McGraw-Hill; 1999. p. 139-80.